Responsive Robotic Dog Just $19.99! Down From $100! Shipped! You are here: Home / Great Deals / Amazon Deals / Responsive Robotic Dog Just $19.99! Down From $100! Shipped! This Responsive Robotic Dog is now on sale at Amazon for just $19.99 down from $99.99 PLUS FREE shipping! Who’s a good dog? Zoomer playful pup! 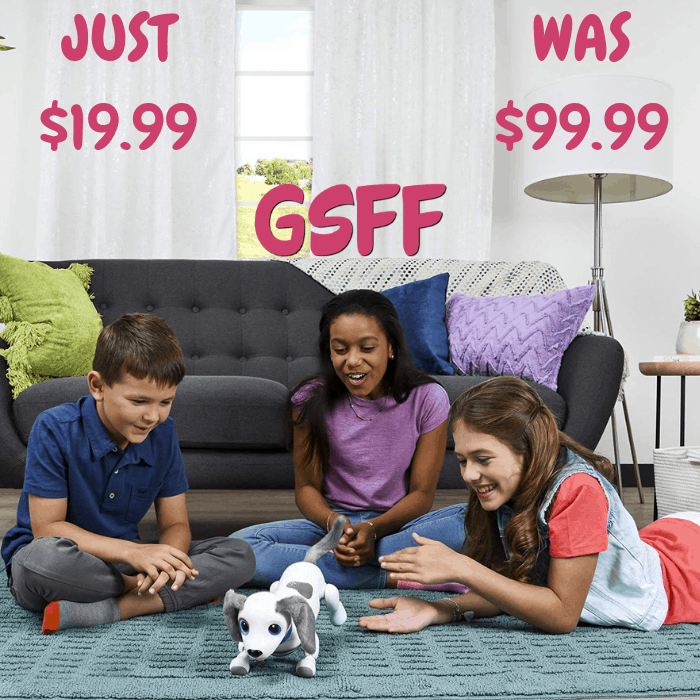 Bring home a new best friend that moves and sounds just like a real dog! using sophisticated voice recognition technology, playful pup responds to sound and touch with cute barks and adorable tricks! Name your new friend and playful pup will come when you call! Full of life, this interactive dog walks, bounces, pounces and plays! ROBOT DOG: Bring home a best friend that moves & sounds just like a real dog! With sophisticated voice recognition technology, Playful Pup responds to sound & touch with cute barks & adorable tricks! RESPONDS TO SOUND & TOUCH: Give your toy robot pet snuggles, cuddles & belly rubs and he’ll “woof” in delight! Give your new best friend a unique name to unlock new tricks & he’ll come when you call! TEACH PUPPY TRICKS: With voice recognition technology, this robotic dog learns more than 25 tricks by responding to voice commands. Train Playful Pup to lie down, shake a paw, beg, play dead and more! FUN & INTERACTIVE: With fuzzy ears, a floppy tongue & wiggly tail, Playful Pup is full of life & ready to play & scamper alongside you! He can bark, beg, wag his tail & respond to your voice & touch! TOP WISH LIST GIFT: Playful Pup makes an excellent gift for boys and girls age 5 and up. It comes with a USB charging cable & instruction book, everything you need to start playing with your new pet!